If you are a user of Windows 10 PC, am sure you must have been using the hell outta that pc. Everyone are now upgrading their pc to Windows 10 cos of it uniqueness and design, no doubt about that. Ever since Windows 10 was launched last year 2015, July, the software has taken over and have a great stand today. Windows 10 has gained more than 350million people. According to Yusuf Mehidi, Corporate Vice President, Windows and Devices Group in a blog post. 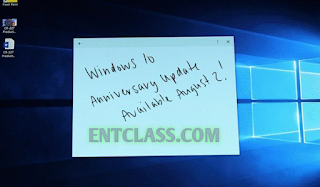 It doesn't end there, Microsoft announced they will release an Anniversary update for all Windows 10 users. The update will be coming with lots of improvements for Microsoft Edge, Start Menu, Notification Syncing, Settings app, Cortana, and other performance improvements. New APIs will be released for the Universal Windows Platform. Windows 10 on PC and mobile will be the first to receive the Anniversary Update. Other devices will get it over time, and we will have more to share on this in the future. The Anniversary Update will start on August 2nd and roll out over time. Given the scale of delivering updates to more than 350 million devices around the world, our rollout will be measured and deliberate to ensure we deliver a great customer experience.